For many, "working in retail" is synonymous with "getting a job-of-last-resort." However, some retail industry jobs like Visual Merchandising Associate positions are popular, coveted, competitive and viewed as being one of the "fun jobs" that the retail industry has to offer. Use this Visual Merchandising Associate job description to discover the responsibilities, qualifications, education, requirements and salary details about this position and what makes it such a popular. Use this Visual Merchandising Associate job description to discover the responsibilities, qualifications, education, requirements and salary details about this position and what makes it such a popular retail career path. Visual merchandising team members contribute to the advertising, marketing, and sales efforts of a retail location by designing, developing and taking charge of the visual look of the store and its merchandise. As a member of the in-store merchandising team, you will be executing merchandising strategies by creating and maintaining visual displays in the store windows and on the sales floor. You will also contribute to the profitability of the store with your merchandise handling, replenishment, and inventory control efforts. The scope of your duties and responsibilities will vary depending on the size of the retail operation and the level of the Visual Merchandising Associate position you hold. In general, your key responsibilities as a Visual Merchandising Associate will include visual display, inventory management, and merchandising training. You may be designing visual displays yourself, or executing the design decisions of another. In either case, you will be responsible for creating and maintaining a compelling presentation of merchandise that will engage customers and help stimulate sales activity. You will be the store's brand gatekeeper, ensuring that the brand image and style of the company is projected at all times. As you execute visual presentation changes, you will be moving merchandise, shelving, and fixtures. You will also be changing signs, and maintaining the cleanliness and functionality of fixtures, signage, lights, and equipment. Because merchandise flow and product placement will be your primary responsibility, your proactive participation in inventory management functions will be vital to the success of the overall merchandising effort. In the course of completing your visual merchandising tasks you will also stock merchandise, take inventory, facilitate stock transfers, ticket and reticket, execute markdowns, and maintain awareness of potential loss prevention issues and activities. You may also participate in the shipping and receiving process and ensure that merchandise is customer-ready before it is placed on the sales floor. As the chief point of contact for new merchandising initiatives, you will generally be responsible for communicating key information that is vital to the success of the initiative. You will help to train the store team about design concepts, visual display standards, and the proper maintenance of the overall visual display effort. By providing on-the-job training, feedback, and recognition, you will motivate other members of the store team to support your visual merchandising efforts actively. Most retail operations will require you to have either retail experience or visual merchandising formal training for this position, and most will want to see your portfolio. Some of the largest retail chains will probably require both education and experience. If you have acquired on-the-job training or expertise, you may be able to obtain an entry-level Visual Merchandising job by demonstrating a thorough understanding of marketing principles and retail merchandising fundamentals. Supervisory experience may be necessary for a Visual Merchandising Associate position in a large store. In smaller retail operations, you will likely be the one-person visual merchandising department and, therefore, you will need to be self-reliant, self-motivated, and can achieve goals and meet deadlines without supervision. In larger stores, you may be executing the merchandising strategies of others, so the ability to follow both written and verbal instruction with great attention to detail is essential. Although working directly with customers on the sales floor is generally not one of the job responsibilities of a Retail Visual Merchandiser, you will often be performing tasks on the store sales floor, and therefore accessible to customers and part of the overall customer experience, You will also be expected to have effective communication skills, and demonstrate the highest level of professionalism and be a role model for outstanding customer service at all times. Visual Merchandisers are expected to have excellent organizational skills, as well as planning, project management, and time management expertise. You will need to possess excellent communication and interpersonal skills, as well as a strong creative flair and effective problem-solving abilities. Stores will be willing to train you with their specific systems and software, but they will want you to bring a basic knowledge of computer functions with you into the position. A working knowledge of Microsoft Office will probably be required as well. Because you will be responsible for creating and changing visual displays, you will need to be able to push, lift, and carry 30-50 pounds of merchandise and fixtures. The Visual Merchandising Associate position is physically demanding, and you can expect to be on your feet and walking for eight or more hours per day. Visual display work often occurs at times when it is the least disruptive to the sales floor and the customer experience. So Visual Merchandising Associates should be prepared to work early morning and late night hours, as well as weekends and holidays. Most retailers will want you to have a high school diploma before you will be given full-time responsibility for Visual Merchandising. 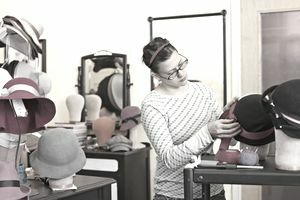 Entry level Visual Merchandising positions may not require additional education, but advancement will probably require additional formal education in visual merchandising, marketing, or both. Visual Merchandising Associate jobs are generally full-time positions which are compensated with a salary between $34,00 and $54,000 per year. The size and geographic location of the retail operation account for the wide salary range. The level at which you are hired, and your experience and credentials will influence your compensation as well. Those working as Visual Merchandisers will receive the same benefits as any other store employee. Benefit packages generally include health insurance and generous discounts on store merchandise.